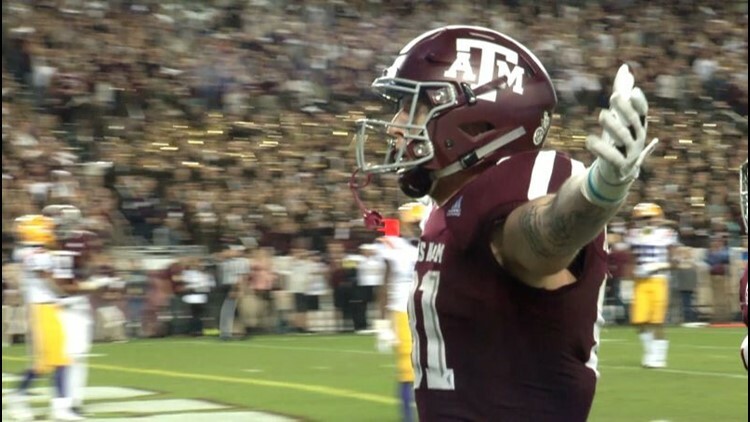 Texas A&M's Braden Mann, Jace Sternberger and Trayveon Williams were named to the Coaches All-SEC First Team as voted on by the league's coaches, the conference office announced Tuesday. BIRMINGHAM, Ala. – Texas A&M's Braden Mann, Jace Sternberger and Trayveon Williams were named to the Coaches All-SEC First Team as voted on by the league's coaches, the conference office announced Tuesday. Mann currently leads the FBS with a 51.15 punting average and is nearly a yard ahead of LSU's Chad Kessler's NCAA and SEC record mark of 50.28 set in 1997. Mann has already set two NCAA records as he broke the single-game gross punt average mark at 60.8 on five boots at No. 1 Alabama and has unleashed 14 60-yard punts, shattering Wake Forest's Ryan Plackemeier's record set in 2005. Sternberger leads the country in receiving yards (804) and touchdowns (10) by a tight end, and is the Aggies' leading receiver. The Kingfisher, Okla., native set the Texas A&M school record for most touchdowns by a tight end in a single season and currently ranks tied for sixth all-time on the Aggies' single-season list. Williams leads the elite conference in rushing (1,524), all-purpose yards (1,802) and touchdowns (16). The junior has posted eight games with 100-or-more yards including two games with at least 200 yards. Williams became the fifth Aggie to eclipse the 1,000-yard mark twice in his career and his 1,524 rushing yards ranks third all-time in Texas A&M school history. He ended the regular season on a tear averaging 175.0 yards per game with 7 touchdowns in the final four games.